If candidate Jacinta Price (pictured in Todd Mall) gets her way the town council can look forward to a frantic 18 months – or more. While she has respect for the three Rs (Roads, Rates and Rubbish), Ms Price says local government needs to go much further. It needs to engage in improving youth services, join the battle against domestic violence, look further than sport in broadening recreational and creative opportunities, and be a robust promoter of local interests to the other tiers of government. Ms Price, 34, is a self-made TV producer: With business partner Julie McAllan she has clinched a deal with a nation-wide television network, First Nation Experience (FNX), in the USA, for a series of 28 minute programs of Yamba Playtime starring Yamba the Honey Ant which she has been playing for eight years. (The image below is from the FNX website). The series, hundreds of programs, is running for five years on the FNX channels in the United States. The company also has a string of contracts with the NSW and Queensland governments for videos and live performances communicating health, hygiene and nutritional messages to children. This includes work for the University of Melbourne trachoma unit, the Care for Kids ear campaign throughout NSW and Queensland, and touring a healthy living musical putting across “how to look after yourself” to school kids since 2011. Under discussion with NSW are similar campaigns about domestic violence and child safety. “Julie will be in Los Angeles this month to meet with FNX to discuss our healthy living roadshow and further broadcasting opportunities,” says Ms Price. The 34-year-old mother of three and step-mum of one is the daughter of the CLP Member for Stuart, Bess Price, a Warlpiri woman. Her father, David, is of Irish ancestry. He has worked as a public servant, a teacher and in recent years for himself as a trainer and consultant. He is a frequent commentator in the Alice Springs News Online. Jacinta Price was born in the Top End where her parents were teachers on Melville Island. They moved to The Centre when she was three years old. Ms Price is fine singer, of soulful folk and hip hop, and a celebrated member of the Desert Divas who’ve performed here for several years. Why is she standing for council? “I’m very vocal publicly in Alice Springs and I’m passionate about what goes on in our community,” she says. Her interest would be across the board, ranging from the business community to the Aboriginal community “because I want my mob to grow and prosper and take advantage of enterprise opportunities as well”. Domestic violence and alcohol needs to be fought by “bringing people together, and getting behind and supporting organisations dealing with people who have an addiction”. Ms Price says that task may well necessitate employing more council staff, or redirection of existing workers, and “Aboriginal people need to be part of that staff as well. NEWS: What other things should the council to be doing? PRICE: They have recently been given funding for youth activities. More needs to be done. From growing up in Alice Springs I know there used to be a lot more activities for kids. We had venues on Thursday and Friday nights, the Youth Centre, for example. We need more places like that, and better support those we already have, so kids can feel they are part of something. NEWS: The council makes a big effort with sporting facilities. Are the arts taking a backseat? PRICE: The Totem Theatre, I think, does a wonderful job [and deserves more support], so does the Gap Youth Centre, creating more dialogue between these places. Being a musician, I was one of those kids who had that in me, to want to create music. I wanted to get out there and do something, because it was a positive way of looking at Indigenous youth and encouraging my peers to do the same sort of thing. But that was all off my own bat. It’s important for kids to know there’s support out there to be creative in their own specialised area, whatever it is they love to do. NEWS: Should the council be an organ for the town, should it gather opinions of the people, and on that basis, make demands from the NT and Federal governments? Should the council be a lobby for the town? PRICE: Certainly. If we can prove that something is working for our community and our kids, then obviously we can ask them to get behind it. NEWS: Should the council be more forceful in making its demands? PRICE: Absolutely. When we’ve got something that works here, and we’ve come together to make sure it does work, we should get that support. 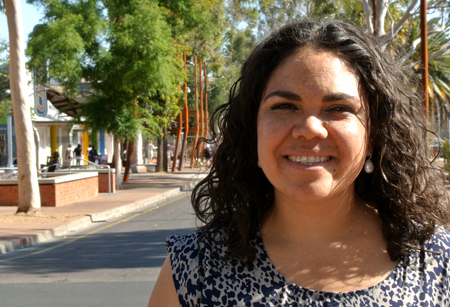 NEWS: Given that the council can be a lobby for the people of Alice Springs, what would you say to the government now? PRICE: Their recent support for youth programs is great. [There could be more support] for art which is positive in its many forms. Everyone can get involved in art. There’s a lot of support for sport, and that is wonderful, but the same kind of support could be provided to grow the arts, to grow music. We need something similar to Brown’s Mart in Darwin, a venue for local performance art, music, for growth. I’d like to see a performing arts academy. Right now to get these opportunities we have to go away from Alice Springs. NEWS: It may bring kids back. PRICE: Yes. Working in television I know producers of children’s TV around the country are having a problem casting Aboriginal kids. My company would support such an academy. We don’t just want to focus on employing Indigenous people in construction. Tourism is something we need to strengthen and we need to tap into the fact that it is Arrernte country, and the fact that this is a selling point. I think it’s wonderful what Doris Stuart is doing, she’s got tours up and running. NEWS: Does the council steer away from big picture issues at the moment? PRICE: I think they do. Having gone into business myself, I know that every little bit of support is helpful. NEWS: Will the seat on the council, if you win it, be a springboard to a seat in the NT Parliament – in your mother’s footsteps? PRICE: I know a lot of people would certainly love to see me go in that particular direction. It may be something that I certainly consider, down the track. NEWS: Should there be party politics in council? PRICE: No. Each one of us is there as an individual, and we have to come together and work as a team. NEWS: What’s your reading of the groupings in the present council? PRICE: I’m looking at every councillor as an individual at the moment. I’ve had a lovely conversation and cup of coffee with Jade Kudrenko. I’m comfortable with Brendan Heenan and Steve Brown. Eli Melky and I have locked horns before but I think he’s a reasonable enough human being. They’re all reasonable enough human beings, to sit down and have a conversation about how can we work together to improve our town. I know I’ll have to make compromises at times, but it’s a matter of being level-headed and a team player. Chansey Paech and I have had differences in the past that we have been able to overcome. It all makes for honest debate in a democratic system. NEWS: Does the council have close enough links with the other lobbies in the town, Chamber of Commerce, Tourism Central Australia, Congress and ALEC? PRICE: There is always room for improvement. All those born in Australia are “indigenous Australians”. Oxford Dictionary: Originating or occurring naturally in a particular place; native. Origin of the word: Mid 17th century from Latin indigena “a native”. @ Peter still banging on about me being Indigenous I see? Do you have an issue with the fact that I am? I have received the same assistance that any person black, white or brindle is entitled to receive with regard to business start up, which by the way is very little and besides this the rest is of my own hard work. This is exactly why I am standing for what I stand for! Opportunity for all to prosper! Now I ask you this, do you not think it possible for an Aboriginal woman to prosper of her own accord? Am I smashing a stereotype or belief you hold? @ Fred the Philistine: If, if, if. If my auntie had balls, I would call her uncle. Right now, what stands between you and great visions is your philosophy of life, your attitude and your inability to take action. Jacinta, regarding your successful business, what assistance have you received on the basis of being Indigenous? @ Evelyn: If I was I the council, the first thing I would do is make sure that the correct rates get sent out. This would save the rate payer $7K. Why are suddenly putting in wheel chair access on footpaths on Hartley and Gregory Streets, when this should have been done 20 years ago or when the original footpaths were laid. We need to look how we can work smarter without having to increase rates. People are leaving the town, not only because of job insecurity, but because the cost of living, e.g. rents, housing, etc. The footpath corners are like an obstacale course. Having said that, there seems to be a lot of parking around the council chambers, how about making some more parking spaces around the town? I might be ignorant, but I am not blind. As I walk my dog every morning around the town centre, I notice the very poor facilities. @ Fred the Philistine: Have you put your hand up for Saturday elections? It does not mean that you have to love the seven candidates, but we should show respect to them for offering to work for the town. As for the rates in Alice Springs, they are not much different than in other parts of Australia. I am certain that the council aims to keep the increase in rates to a minimum in order to lessen any impact on ratepayers, but at the same time generate enough income to provide adequate levels of service that the people of the town expect. @ Fred The Philistine: Unless you are actually Peter I wasn’t directing any comments toward you with regard to nationality and if you’d understood where I am coming from then you’d have understood that my plan all along has been to listen but not just to those who have the loudest voices like yourself, but to everyone. I would also encourage those who feel they are voiceless to speak up. You would also realise I support industry but I support the fact that we all need to be involved, we all need to contribute and we all need to feel part of this community. You appear to value yourself and your ideals over others because you are a ratepayer but a ratepayer with tunnel vision and perhaps my attitude is too liberal for your thinking. I only take on board criticism if it is in fact constructive as anyone with any intelligence would do. Thanks, Fred, we all must learn to listen. @ Jacinta: I do not care if you are indigenous, an African, an Australian or what ever nationality, the issue here is that we need people in coucil who are going to work for the people. You need to listen to what the people want, take the critisism as a positive and work on it. Listen to the people who are paying the rates and living in this town. If you continue to take this attitude you are not going to last long in council. We need to develop industry in this town for it to prosper. Steve: Maybe my previous post was slightly harsh but if things go up such as power expenses, payroll expenses and the like go down. Governments and businesses have done this before, it is not new. I ask why the council didn’t do this and don’t really want to meet about it, I am just making a point on a forum. BTW, I also get that you to have agreement of the council to get things done. So getting some sometimes isn’t that simple, perhaps my post was and is directed at the whole council. Go for it Jacinta, hard and strong. Take constructive comments on board but ignore the knockers. Good luck. I find it fascinating that those who speak with pseudos or just first names lack the bravery to be transparent in public and speak as who they truly are. We who put ourselves out there in the face of your criticism are actively doing what we can to contribute to this community we love. Why is it that you, Fred the Philistine, or any of those who are part of your minority group of pessimists are not putting your hands up to stand if what you say is in fact true? I have never and will never use a pseudo as I don’t have some other underlying agenda, what you see is what you get, like it or not. Next time I suggest you throw your hat in the ring, practice what you preach and let the community decide whether you are worthy. In fact anyone here who has nothing but criticism to offer please humble us with your answers and tell us how you would better do things. Perhaps give us an idea of your expertise? If I am elected and you in fact have anything constructive to contribute I may just well take it into consideration as a councillor. Oh, and @ Peter, please don’t patronise me with your comments about better placing my ambitions as a strong Aboriginal women, we don’t all belong in Aboriginal organisations because we are Aboriginal and as I’ve explained I don’t take advice from those not willing to reveal their true selves. And I am already busy successfully running my own business, did you not read the article? As I have been talking to people in town about their opinion on the council elections, they are going to get their name crossed off the electoral roll. Their concern is there is no-one worthy of voting for, and my comment was I agree: If this town is going to prosper we need industry and a more responsible council. @ Dave: Rates will necessarily go up in keeping with CPI. While councillors would love to keep the rises to CPI we are continually forced to deal with cost shifting from Federal and Territory Governments. For instance, we are currently facing a hefty increase foisted on council by PAWA, offloading completely unexplained costs for the provision of street lighting. Keep in mind that every one hundred thousand dollars of increased spending equates to a 1% rate rise, so if we were to pass this cost on in full it would amount to a rate rise of some multiple %! And that’s before CPI! Given that council has had to deal with a large reduction in grant funding and a number of unexpected cost increases from PAWA over the past few years, I think we’ve done a pretty good job of absorbing those costs through savings on existing spending! As we will again on this occasion. You can rely on councillors going all out to keep rate increases as close to CPI as is possible without putting your community asset, the ASTC, at risk. Dave, I am a small businessman running a small electrical contracting business. I am also from a very large local family many of whom are involved in local businesses, large and small. There’s not too many around that would have a better grasp of what’s happening on the ground than myself! Further, to suggest that councillors are receiving payments, snout in trough, regardless of what’s happening in the local economy is ignorant and insulting. Councillors get paid somewhere around $14,000 per year, which mate, is a tiny fraction of what I would earn if I were to remain at work instead of attending to council business! Nor does it equate to anything like the amount of damage I do my business by not being in attendance because I am in one way or another involved at council. Just recently I have taken on the Deputy Mayor role which pays quite a bit more [happy to give the figure when I check it] but the workload is many times heavier. Check out my monthly report, it’s on the record. So have a gripe, we all do, but be fair and maybe just once in a while come up with, or do something useful to help your community yourself! I didn’t see any Daves among the list of candidates. For those who are concerned about this idea of spending more money and increasing rates, as Steve has pointed out, I am not interested in raising rates but I am interested in looking at ways of spending money more wisely. I do not claim to have all answers but I am willing to learn what it takes to better serve this community. @ Desert Rat: If elected I plan to see through my full term and beyond without unnecessarily costing rate payers money and time. Thanks to all others for your support. Steve: We don’t have to discuss the rates. What’s the point, they won’t go up. Everything goes up but 6% a year doesn’t usually happen in the real world. Long council discussions were held but the rates go up and of course you still get paid. The council can set its own increase and is not exposed to the commercial reality like most businesses as price increases lose customers. Well, hang on you may lose customers – doesn’t matter, just increase the rates to the existing ratepayers to cover the shortfall. Jacinta is just setting herself up to run for the CLP at the next General Election or if there is a by-election during the next term of the NT Legislative Assembly. @ Peter: In Council individuals don’t get to have “spending programs” all spending, after considerable discussion, is approved by majority vote in fact more often than not by unanimous vote. Individuals running as candidates should be judged on their local awareness understanding of where we have come from and where we should be going as a community, their intellect, energy and passion, their ability to work with others and of course whether they are regressive in intent on a return to the stone age or progressives looking to create or facilitate new jobs, industries a healthy level of growth creating opportunities for both ourselves and our children. Jacinta and her family have demonstrated over the years fierce commitment and passion to progressing our community, that would make Jacinta an excellent candidate. If you agree give Jacinta your vote next Saturday. @ Harold: This year council rates rose 6%, the values have fallen 5% but this has not been addressed. If council do not waste money like issuing the wrong rates there would be no need to raise rates. After seeing the fiasco with the last rates, one wonders about the council’s competency, if they can’t get the rates right. Steve, the issue of rates and Jacinta’s candidacy are not separate since she is proposing new expenditure that we the rate payers will have to fund. So that Jacinta can have a fair hearing she needs to cost her program so we can estimate the rate increase or tell us what services will be cut to fund her plans. It is a worry that you are endlessly defending a big spending candidate. The year to year rates increases in this town are unsustainable. @ Steve: Could we ask the candidates to tell us if they intend to put their candidature for the next Northern Territory general election scheduled for 27 August 2016? @ Harold and Peter: I’m happy to discuss rates anywhere, anytime. My number is widely published, maybe write a letter to the editor, I’m happy to take the issue up in that forum. In the meantime we have to elect two new councilors. I would respectfully ask you to give Jacinta Price and all that she represents a fair hearing. Well that good news. Councillor Steven Brown has all but confirmed no more rate rises going forward. Council has a balanced budget, so rates will only be going up as the underlying land values go up. No more little % increases against the land value in the foreseeable future, Steve? No wonder council has a spending problem. Bit surprised that an elected member cannot handle a couple of comments regarding fiscal responsibility without getting narky himself. Steve: Not grouchy narks but increasingly desperate rate payers who are wondering how we can afford to live in the town and what its future will be when rates soar upward year after year. Also legitimate concerns about basic services when the council has no clear idea of its role. So for every new expense Jacinta brings to the table we need to be given the details of the cuts that will be made to pay for it. The extra cost implied in Jacinta’s program would have to gain acceptance from a majority of 5 out of 9. Nothing to be scared of there. The huge benefit to Alice if Jacinta gains a seat would be an increase in youth representation. This is something we need, not something to sneer at. What a bunch of grouchy narks! Is there anyone of you who can stop winging long enough to give some thought to just what a enormous asset to Council Jacinta would be if elected? The discussion around funding to the arts versus sports and other community activities often comes up at council. It’s not about spending more its about balancing what we already spend. I am absolutely certain that Jacinta would bring a new and interesting perspective to the discussion. I’ve just finished reading another extraordinary speech from Jacinta’s mother Bess Price that Jacinta, deservedly proud, has posted to her Facebook Page. Do yourselves a favor, read it. Gain a little understanding of just how important the likes of Jacinta are to our town’s future and get behind her campaign! A strong Indigenous women like Jacinta could fulfil her ambitions much better within one of the town’s corporations. Perhaps she could get a job with CentreCorp and encourage them to adopt her social platform. Or she could work with Congress to help them offload their embarrassing Memo Club. The list is endless and the funds not accountable to hard working, rate stressed citizens of the town. Gotta agree with the recent comments. The council needs to be looking at ways to reduce the burden on the ratepayer, not increase it. If existing areas wastage is identified and costs reduced, I would be happy if a portion of the savings gets deployed into other areas. But it’s not a limitless pot of money. Not at ratepayers’ expense please. The council should do less, do the basics and do them well. And not have outrageous rate hikes year after year. Jacinta has numerous ideas on how the council can spend more money. As a rate payer I want costs cut not increased. Currently rates are rising rapidly and the prospect of further rises to support the arts or youth services is not something I would vote for. I will be voting for whoever focuses on roads, rates and rubbish. Leave the youth services and arts to the NT Government. If the current youth services or arts programs are not good enough, complain to your local member of parliament. Deadly. Good on you, Jacinta. Best of luck. Well there you go – more rates! The ASTC is only going to be happy when they have driven out all of the ratepayers looking for some where cheaper to live.